Meat slicers make the task of slicing meat, cheese, and other foods with speed and ease. Deciding which food slicer to purchase can be confusing, so we're happy to help you decide. You can rest assured that we at Meat Processing Products only offer the highest quality meat and food slicers, so you are sure to be satisfied. What Will You Be Slicing with Your Food Slicer? If most of your slicing is low volume or you plan on slicing infrequently, a manual food slicer may be right for you. However, if you need to do large volumes, require consisten thickness, you will want an electric food slicer. Electric food slicers allow you to slice large amounts of meat, cheese, or other foods at one time. For large food slicing jobs, an electric meat slicer gives you a precise slice every time without constant supervision, so all of your food slices come out with the same thickness. How Many Hours a Day Will You Be Using the Slicer? Our economy food slicers are perfect for light duty applications. If you�re slicing over 4 hours a day, the heavy duty meat and food slicers provide increased durability at a value price. Will You Be Slicing Cheese? Slicing cheese is one of hardest things for a food slicer to slice. Unlike many other models, all of the food slicers we offer here at Meat Processing products have the power to slice cheese consistently. However, if you�re slicing any more than a small amount, you should consider a heavy duty food slicer. What are the Dimensions of the Largest Product You Will Be Slicing? 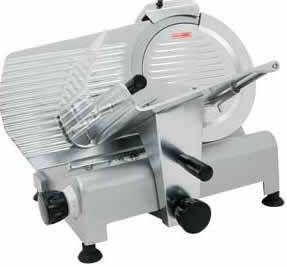 Make sure you select a meat slicer that with a slicing blade that will fit what you are slicing. Be sure to consider not only what you are currently slicing today, but also think about what you will be slicing in the future. What is the Thickest Slice You�ll Need? Always make sure the slicer you select will cut as thick as you need. What Will You Be Slicing in the Future? It pays to think about what menu items you may add in the next couple of years. You can save a lot of money in the long run by buying for the present and the future. Does the size of the blade matter? Yes, blade size should be a factor in your search for a slicer. The volume you�re cutting and the size of the product are key factors in selecting a blade size. Smaller operations can often manage with a 7� or 9� blade. Higher volume operations need at least a 10" or a 12� blade. You'll be pleased with our large selection of food slicers for you to choose from. Here are some links to our most popular model food slicer models.